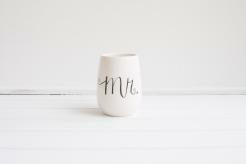 Wedding dishes for the Mr. and Mrs. make great bridal shower or wedding gifts. These ceramic 8oz. 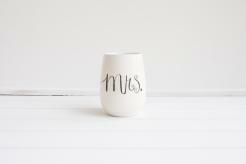 stemless wine glasses are hand painted with Mr. or Mrs. design. Pricing is for one stemless wine glass. Dishwasher safe, top shelf.